The 1950s were characterized by a quest for stability following the turmoil of the Second World War. The U.S. began to show its industrial might, and the American middle class was soon able to afford automobiles and other tokens of prosperity. The ’50s were also a time of optimism, and this was reflected in some of the jewellery from from that era. The early ’50s were dominated by regal figures. Elizabeth II was crowned Queen; Harry Winston was dubbed “the King of Diamonds.” The war’s end, less than a decade earlier and the subsequent easing of restrictions on the use of precious metals paved the way for innovations in their use and application. The smooth, polished surfaces that gained dominance from the 20s onward gave way to intricate and often contrasting uses of yellow or rose gold. And thanks to its renewed availability platinum was everywhere. Textures deepened and grew more sophisticated, including scrolls, drapes and fringes, and the use of braided and rope-twisted wire. While the motifs of the previous, modernist-inspired decades remained relatively unchanged 50s Jewellery design was characterized by more whimsical and directly representative motifs, such as Bowers, animals and human forms. In 1953, Marilyn Monroe proclaimed that “diamonds are a girls best friend.” The world seemed to take note, but designers didn’t neglect to invite other colored gems to the party Not since the turn of the century had such attention been paid to gemstones. 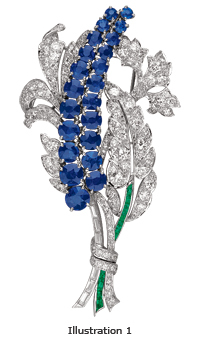 Popular choices included amethyst, aquamarine sapphire and other rich, saturated, colored stones, sometimes in unusual pairings, like this jewelled clip (illustration 1). Diamonds were often pear-shaped or emerald-cut, used as solitaires or combined in single jewels featuring multiple marquise cuts and round brilliants. 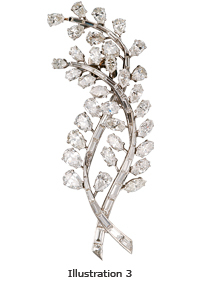 This diamond and platinum clip (illustration 3), uses marquise and pear-shaped diamonds to represent the leaves of entwined sprigs. Diamonds were also being set more often in individual claw settings, contrasting with the pave settings of the pre-war period. 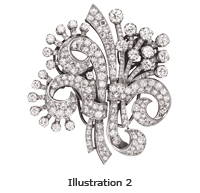 A greater sense of movement and dimension was the result – visible in this diamond and platinum double-clip brooch (illustration 2). These new varieties of gemstone shapes and settings found new heights of diversity in an old motif – the extravagant spray. Sprays usually featured diamonds mounted in platinum as the central focus, sometimes accented by colored gemstones. Sprays achieved renewed popularity, with the revitalization of the old floral motif in more energetic, abstract representations. These elements are visible in this ribbon spray brooch by Birks, circa 1950 (illustration 4). The spray’s popularity during the ’50s might be attributed to the new optimism of the age and a conscious desire for more feminine subjects compared to the rigorous, military influences of the war years. The combination of increasingly sophisticated machine tools and rapidly growing markets led to a much greater availability of fine jewellery in the post-war decade. The markets, however, were no longer content to merely accept the trends promoted by top designers. This preference, coupled with the devastation of many European jewellery centres during the war, meant a shift in focus to the emerging U.S. market and the growth of new masters such as Harry Winston, David Webb and Paul Flato. Buyers in the ’50s rejected the angular and geometric forms of the ’20s and ’30s. Discerning collectors and occasional buyers alike were seeking unique jewellery that reflected the craftsmanship of the maker, while at the same time representing their own personalities. For the most part, designs were playful and romantic, with plenty of organic curves and ornamentation. As a result, the jewellery of the ’50s has a distinctive charm. It was influenced by a collective belief in the goodness of products, industry and American-style democracy. The jewels it produced still reflect this spirit in their inimitable, exuberant style.